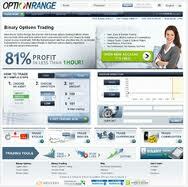 Option Range is a leading binary options trading platform catering to traders across the world. The trading platform, which is powered by TradoLogic, will be allowing range binary options trading in shorter intervals of 30 and 60 minutes. However, these new range options will be available only for a limited period and can be used for EUR/USD, GBP/USD and the EUR/GBP currency pairs. The return ratio of these new options is a whopping 171%. Currently, Option Range has a good assortment of trading options for all the assets it covers, including commodities, currencies, stocks and indices. Investors using the Option Range trading platform have three trading options – digital trading, touch trading and range trading. Under the digital trading option, a trader will predict the performance of the asset and is considered to be in-the-money if he gets it right and out-of-the-money otherwise. In the touch trading option, a trader gets to predict if a particular asset will ‘touch’ a predetermined strike price within a given time frame, or not. The new range options allow the trader to predict if the value of the asset will remain between two preset points (prices) within a particular time period, which is 30 minutes or 60 minutes. Option Range has also announced that it plans to add more number of trading options for its other assets, for which it would increase the maximum trade amount. With regards to its new options, the company has received a positive response from its members, after it had offered a 20% bonus to all the deposits above $100, till February 19, 2012. Whether you are a novice or a seasoned binary options trader, Option Range has excellent trading options for you. The trading platform is easy to use and is considered as one of the most secure in the world. The platform can be accessed directly through your web browser, and requires no download or installation. The platform also offers tools such as Close, which allows traders to close their trade before expiration, and Extend, which allows them to extend the option’s expiration time after buying.